The Corinthian Classic Yacht Regatta recognizes Classic GRP (Classic Plastic) yachts as the fastest growing segment in “Classic Yacht Racing” today and we encourage and support all the participation we can get. If you've got a "Classic" than this is a P-E-R-F-E-C-T venue for getting out and really sailing her for fun and maybe a bit of glory. 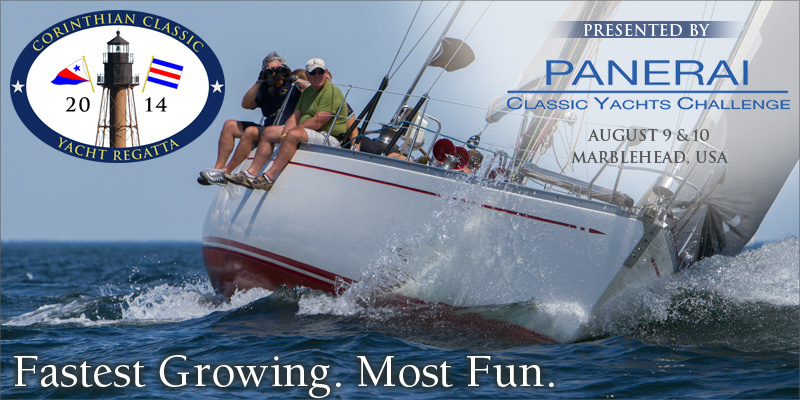 The 2014 Corinthian Classic Yacht Regatta presented by Officine Panerai (www.panerai.com), the title sponsor of the Panerai Classic Yacht Challenge Circuit that takes place in the Mediterranean, Marblehead, Nantucket and Newport will be held on August 9th & 10th. We had 60+ boats in the CCYR in 2013 and we’re looking to be just as strong this year. It’s a lot of fun and it’s great racing. You own a "Classic", now it's time to have some fun with her. Instructions to enter can be found on our website at www.corinthianclassic.org.